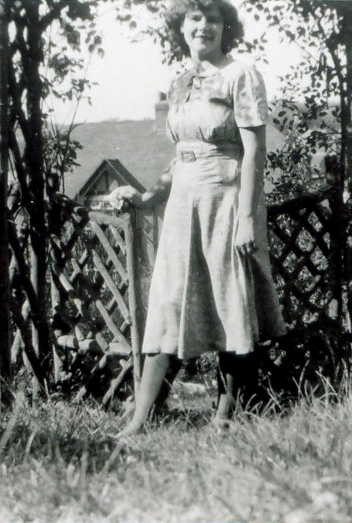 Miss Payne was the teacher of the 6 year olds at St John’s in the 1940s to 1950s. This photograph was kindly given to me by her husband; it is undated. The children all seem to be enjoying the climbing frame, especially the three boys right at the top! I doubt that children would be allowed on a school climbing frame now, which is a great shame! I am the boy on top of the frame holding Miss Payne’s hand. The date must have been around 1956-7. I can name some of the boys: Alan South (next to me), Wally Grant, David Denyer, Peter Carron & Roy Moseby. I lived at 15 White St and attended the Infants School and the Junior Scool for a short time, before moving to Haywards Heath. I still have my school report signed by Miss C. Payne. How wonderful to see a photo of her after all these years. Miss Grout, had the classroom upstairs. I had a feeling that Miss Payne married 1947/8. I remember the afternoon sleep, in the nursery class. What a wonderful collection of photographs, which I am not on, nor can I at present put any names to. Hi, remember me Richard? You lived next door to me. Am I in the picture above? Hi Rita of course I remember you. You lived at the top in the arch at Kingswood Flats, I remember your brother Barry and Sylvia. Are you sitting in the front row on the right in the photo? I was in Miss Payne’s class,too, in the early 50’s but not sure if I’m in this photo. I remember at the end of lessons each day she offered a glass jar of sweets from which each child could take just one. I recall they were very small; probably dolly mixtures. Thinking of it now, I guess she paid for those herself as I don’t suppose the school would have done. What a nice lady. I went to both the infants and juniors too and, like so many others, remember the afternoon naps. Are you Richard? I assume I’m the one holding the doll? Hi Rita: Yes that is you holding the dolly,Val Douglas is standing directly behind you. Do you remember anyone else in the picture? Hi Richard, could you pin point Wally Grant and Peter Carron please? Hi Kirsty. 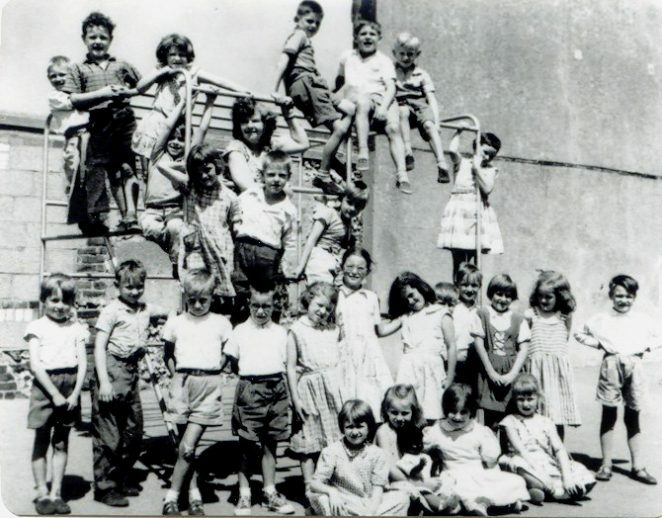 Wally Grant is at the top of the climbing frame on the left with curly hair. Peter is at the far right of the photo with his hands on his hips. Hope this helps. Hi Richard Golds, I’m pretty sure I went to this school. I lived in Newhaven Street until 1959, when we moved to Middlesex. In them days I was known as Brian Roffey. It would be nice to know if this was the school, also if anyone may remember me. I think a friend of mine from my street was Ronnie Barton. Hello, can anyone out there help me with information regards which infants/juniors school I may have attended? I lived in Newhaven Street until the age of nine, we then moved to Middlesex. The year would have been 1955/59. I remember the brewery at the back of our house and my sister Barbara putting her leg through the glass skylight when she climbed up on the roof with my other sister Lorraine. We must have all gone to the same school. Any help would be great. Our surname in those days was Roffey.